Toyota has improved the profile of autonomous vehicles by integrating the sensor systems into the design of the latest Lexus Platform 3.0. Toyota Research Institute (TRI) will show its next-generation automated driving research vehicle, Platform 3.0, at CES (Consumer Electronics Show) this year in Las Vegas. The new platform, which is built on a Lexus LS 600hL, combines greater technological capabilities with new harmonised styling that integrates the automated vehicle technology into the LS model’s design. TRI approached development of a new research platform with three core principles: (1) Elevate perception capabilities; (2) Blend the sensing equipment into the vehicle design with a distinct appearance that is sleek and elegant; (3) Package the automated vehicle technology in a manner that is easy to reproduce for building a fleet at scale. Platform 3.0 represents a maturing of TRI’s automated vehicle research. Experimentation has transitioned to narrowing in on a technology package with a more defined sensor configuration and level of performance that helps catapult proficiency in understanding the world around the car. Platform 3.0 has a very sensor-rich package that makes it one of the most perceptive automated driving test cars on the road. The Luminar LIDAR system with 200-meter range, which had only tracked the forward direction on TRI’s previous test platform, now covers the vehicle’s complete 360-degree perimeter. This is enabled by four high-resolution LIDAR scanning heads, which precisely detect objects in the environment including notoriously difficult-to-see dark objects. Shorter-range LIDAR sensors are positioned low on all four sides of the vehicle―one in each front quarter panel and one each on the front and rear bumpers. These can detect low-level and smaller objects near the car like children and debris in the roadway. The new platform remains flexible for incorporating future breakthrough technology as it becomes available. 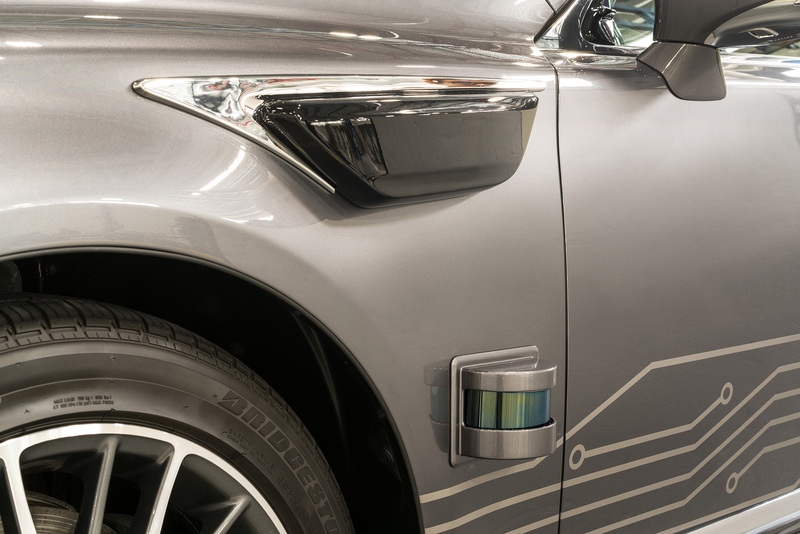 TRI engaged the expertise of CALTY Design Research in Ann Arbor, Michigan and engineers at Toyota Motor North America Research and Development (TMNA R&D) to compact and conceal the sensors and cameras. They created a new rooftop weather and temperature proof panel, cleverly using available space in the sunroof compartment to minimise the overall height. Their ingenuity eliminates the look of equipment as bolt-on appendages and replaces the “spinning bucket” LIDAR sensor that has historically characterised autonomous test vehicles. CALTY designed the confident image of the rooftop panel, defined as intelligent minimalism, which is inspired by off-road motorcycle helmets. The forward area has a crisp technical look that becomes more fluid and aerodynamic toward the rear of the car, unifying with the contour lines of the LS. The panel is embellished with chrome trim that runs along the side where it meets the roofline. The vehicle’s computational architecture for operating the automated vehicle components, which previously consumed nearly all the boot space, has also been consolidated. The electronics infrastructure and wiring in condensed into a small box. Production of Platform 3.0 vehicles begins this spring. The Prototype Development Centre at TMNA R&D headquarters in Michigan, which has expertise in low volume, specialist production, will create Platform 3.0 cars from stock Lexus LS models. Production volume is intentionally low to allow for continued flexibility given the pace with which TRI has progressed in updating its test platform. There have been three major updates, including two new generation test models, in less than a year and TRI anticipates continued rapid developments. A proportion of the new test vehicles will be assembled with the dual cockpit control layout that TRI debuted last summer. This arrangement is for testing TRI’s Guardian approach to automated driving, experimenting with effective methods to transfer vehicle control between the human test driver and the automated system while maintaining a safety driver as a backup. Single cockpit vehicles, like the one on display at CES, are used to test Chauffeur, which is TRI’s approach to full vehicle automation. Both Guardian and Chauffeur test vehicles use the same technology stack of sensors and cameras and similar software.